Has Mount Robson been on your bucket list for some time but you don’t feel like you have the skill set to lead or be a confident second? Has the Silverhorn Route on Athabasca been calling to you? Or maybe one day you would like to lead a group of friends up to the top of Mount Rainier? Then the AMP program may be just for you. The Chair of the newly created Alpine Committee, Lida Frydrychova, (alpine@acccalgary.ca) has teamed up with ACMG Guide Brent Peters to develop an alpine mentorship program for the Calgary Section of the Alpine Club. The goal of the program is to develop the skills of our current members to learn to lead safe and successful alpine trips. The program has been broken up into two phases. Phase 1 takes place in the winter and spring and builds your skills and fitness for the summer months. Phase 2 takes place in the spring and summer. 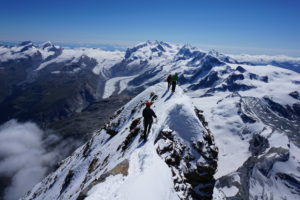 This is where you can apply your skills on summer alpine trips. In both phases, you will be mentored along by Brent Peters ACMG guide who will teach you how to do things in the real world, on real objectives and under changing circumstances. Have a history of leading and participating in ACC trips, private or other clubs’ trips ski, alpine or scrambling trips. Further the skills of “Advanced Beginner” to “Intermediate” mountaineers who have done a handful of alpine and lots of scrambling or ski mountaineering trips in order to allow them to move from PD to AD level. Beginner mountaineers who have been on a glacier once or twice, 3-person crevasse rescue, completed a 2-day Snow and Ice course and have done steep snow slope climbs as part of their scrambling trips. These members have done only one alpine trip such as Athabasca and want to do more of similar trips such as Aberdeen, Harrison, Lefroy or similar.